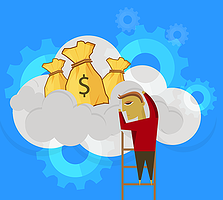 Running a business server can get expensive. Between maintenance, equipment, housing, and security, the costs add up very quickly. In fact, for most businesses that don't have very specific and specialized server needs, running a server in-house is a gross inefficiency. Even co-location, the practice of housing a server at a communal space while paying for the equipment and maintenance yourself, is usually unnecessary for most small and mid-size companies. An alternative that makes much more sense, both financially and practically, is a virtual server. In a virtual server environment, your company's server exists as a virtual machine running on a shared server operated by a hosting company or managed service provider. Because your server shares physical space and computing resources with others, costs to individual servers remain low, and maintenance is split between everyone on the server and figured into the monthly costs up front. So, what are the benefits of switching? Here are the top four. Since making its debut now over 10 years ago, virtualization is one of the most important technologies that the IT industry has been blessed with. I’d even go one step further and declare that virtualization has pioneered a top-to-bottom overhaul of the computing industry. Virtualization is being used by a growing number of small and medium-sized businesses to reduce operating costs in a number of areas such as: purchasing physical servers and associated hardware, power consumption and air conditioning, and server room / data center footprint. A major benefit of server virtualization is high availability for critical applications and the ability to streamline application deployments and migrations. Virtualization can simplify IT operations and allow IT organizations like Dataprise to respond faster to changing business demands. The socio-political ramifications of global warming requiring good corporate citizens to meet greenhouse gas reduction targets, creates an added incentive for virtualization. Today, like many larger enterprise companies, small- and medium-sized businesses (SMBs) are adopting virtualization. Why? Like most business decisions, the decision to virtualize comes down to cost savings and productivity gains. This technology minimizes hardware costs by moving from physical to virtual (i.e. software-based) servers. The radical shift from traditional “big iron” hardware solutions to virtualized “cloud” based systems allows users to operate one piece of hardware to support multiple systems.